DraftKings has opened their 2016 Fantasy Baseball Contest Lobby! 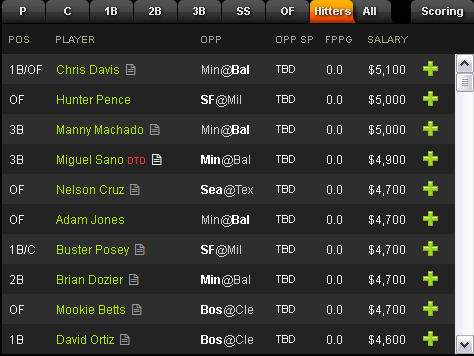 The 2016 Baseball season starts on Monday, April 4th with a full slate of Daily MLB fantasy contests on DraftKings.com. 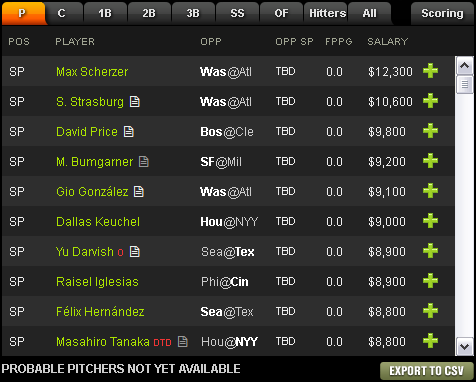 DraftKings Fantasy Baseball Scoring and Details. 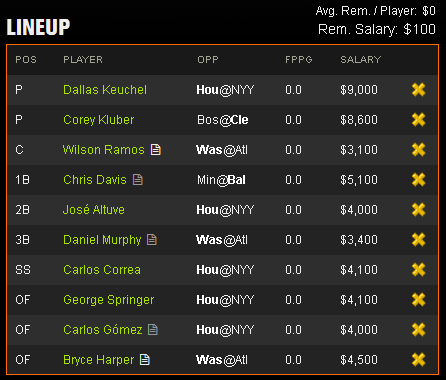 To get the ball rolling, DraftKings has set their opening day special events and are taking entries as we speak. $400K Season Opener, $27 entry, $100K to the winner, 3475 winner paid. $25K Knuckle Ball, $5 entry, $5K to the winner, 1150 winners paid. 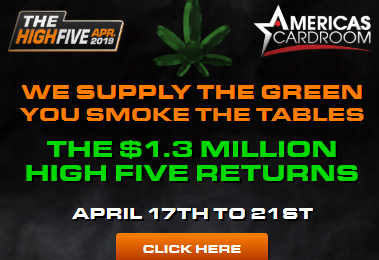 $25K Solo Shot, $1, $2K to the winner, 5860 winners paid. $10K Flare, $2 entry, $600 to the winner, 1150 winners paid. $10K Quarter Arcade, 25¢ entry, $500 to the winner, 10000 winners paid. There will also be hundreds of other contests to choose from, including heads up, 3 team, 5 team 10 team, 20 team, 50 and 100 team leagues and contests. The player salaries are locked for opening day, probable pitchers are not listed just yet, they will be noted when the starters become official. Here’s a possible Opening Day Line up I might be using (Depending on what happens between now and opening day and if Keuchel and Kluber are the probable starters). « Fan Duel and DraftKings to pull out of NY?